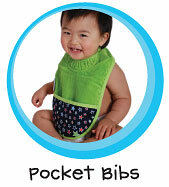 Its title may be silly, but Silly Billyz Bibs are anything but silly. They’re practical. They’re useful. They’re entirely sensible. And they’re completely reasonably priced. Most of these bibs, infact, are less than $10. What makes Silly Billyz Bibs so special is that the collar is cut higher, so that it goes all the way up around the neck, almost like a turtle neck (though the elastic is way more forgiving than a turtle neck). The purpose? To keep food and drink from dribbling down the neck and chest. Instead it collects at the neckline and flows onto the bib. Making a lot less food mess. We sampled a “Toweling Pocket Bib” with a terry front and a nylon back to keeps spills from seeping through onto clothing. With its unique neckline (which attaches with a snap in one of 2 positions, allowing for growth and longer wear) and pocket to catch crumbs and spills, this bib is completely mommy, baby and toddler friendly. Silly Billyz are my all-time favorite bibs! That new toweling bib looks great, too! I’ll definitely pick up a few of those for the new baby. I also love the fact that they don’t have velcro. My 3-year-old still can’t undo the snaps, plus there’s nothing to snag in the laundry.